White quadrant cladding trim with a matte finish in 2700mm or 4000mm length. 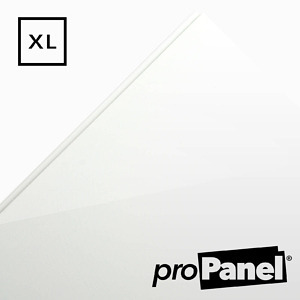 The 1m wide Gloss White wet wall panel is the most versatile from the PROPANEL® XL Shower Wall range. It is a low cost and less hassle alternative to traditional, regular tiling. 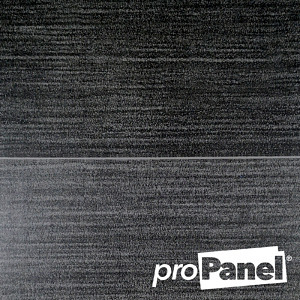 This shower wall panel can act as a contrast or simple beautiful feature wall for your bathroom or shower enclosure. 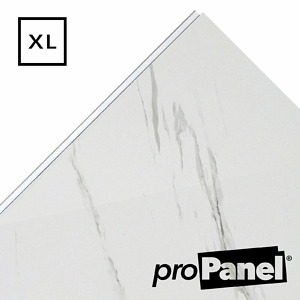 The beautiful Carrara marbling is a natural range of wet wall cladding from PROPANEL® XL Shower Wall, for a cheaper cost and less hassle than traditional, regular tiling. This luxury styled panel can create a beautiful feature wall for your bathroom or shower enclosure. 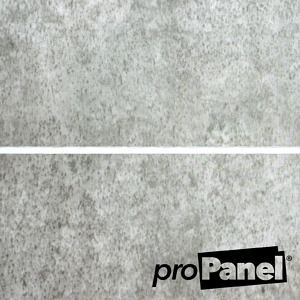 The Urban Concrete effect panel is part of the natural range of wet wall cladding from the PROPANEL®. 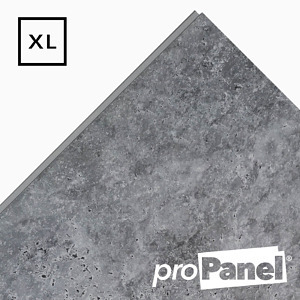 At a cheaper cost with less hassle than traditional, regular tiling, the XL Shower Wall is perfect as a feature wall with near seamless joins. This luxury styled panel can create a beautiful feature wall in any room not just your bathroom or shower enclosure. 8mm silver chrome effect coving cladding trim for 8mm cladding panels in 2700mm and 4000mm lengths. The stunning Modern Tile range of cladding from PROPANEL® can give you the look of tiles for a cheaper cost and less hassle than traditional, regular tiling - plus some extra benefits. 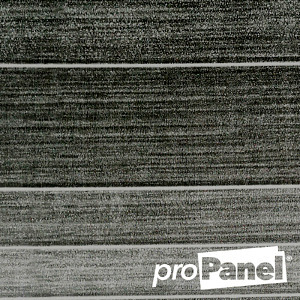 Mix and match within the range of panels to create feature walls throughout your room to great effect. Stunning modern tile effect design! 8mm matte white cladding offers an alternative choice to regular 8mm gloss white cladding. Looks great with plenty versatility. It is a safe and stylish option well suited to a wide range of projects, not just walls and ceilings. With a matte white finish you get a more diffused light finish without the halos from the bulbs often seen in gloss panels. It will give any room a naturally, bright, elegant finish. 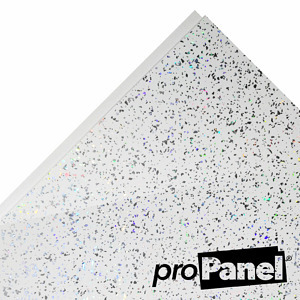 The PROPANEL® Single Inlay Chrome 8mm cladding panel is one of our most popular panels particularly for use on ceilings. 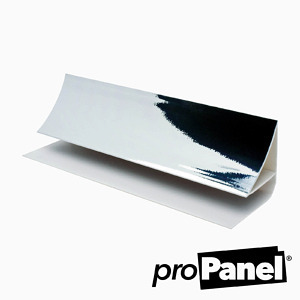 It offers a stylish subtle alternative to the regular white gloss cladding panels and helps to hide the joins due to a thin 7mm chrome line running along the panel join. 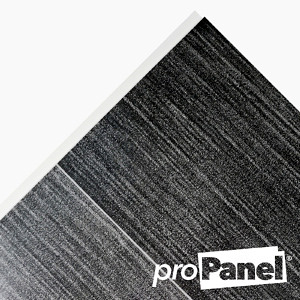 Regularly mistaken as real tiles this graphite coloured panel features a stunning tile effect, with realistic textured grout lines that gives you the luxury look of tiles for a fraction of the price. It is often mistaken for actual tiles at first glance as many people have not seen decorative cladding of this type before. CUTLINE - Realistic tile effect grout lines! 3m gloss white cladding in 8mm thickness is one of our best selling style of panels because they are incredibly versatile and look great. These extra length 3m white cladding panels are great for longer length ceilings and walls in your bathroom or kitchen. Ideally suited to the widest range of projects. With a glossy white finish they reflect light well, making any room look instantly fresh, clean and bright. 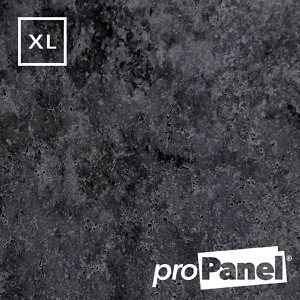 One of the best sellers is our Stone Grey Tile Effect cladding panels. Regularly mistaken as real tiles this tile effect panel features a stunning tile effect, with realistic textured grout lines that gives you the luxury look of tiles for a fraction of the price. It is often mistaken for actual tiles at first glance as many people have not seen decorative cladding of this type before. When it comes to PVC cladding panels and trims you can trust that you are buying a premium product when you see the PROPANEL® mark. 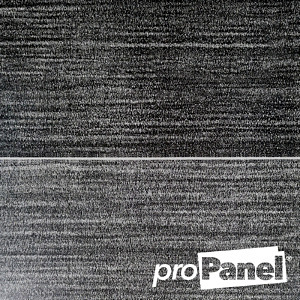 Not all wall panels are the same. 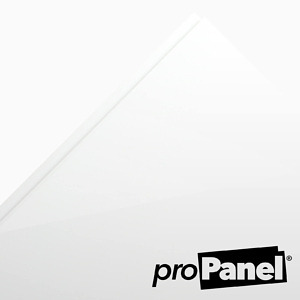 With PROPANEL you are getting a high grade of PVC which is stronger and more durable to be used in your projects. 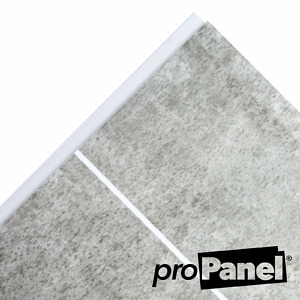 The grade of ingredients used in the manufacturing process means the panels suffer minimal honeycombing and are more susceptible to damage. Many other brands panels bend or puncture easily. 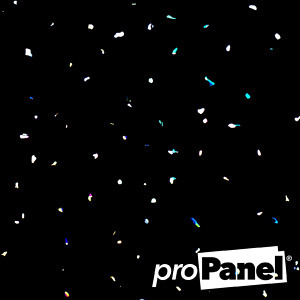 All PROPANEL PVC panels and trims are class 1 fire rated as well as being 100% waterproof. This allows them to be used in wet areas including your bathrooms and showers. 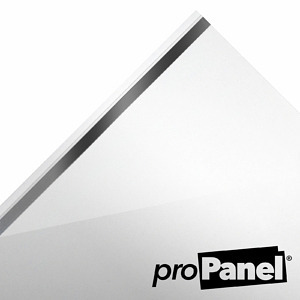 With a wide range of styles and colours there is something for everyone with the PROPANEL range. 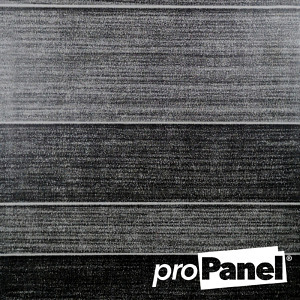 There ranges of panels across Pro5, Pro8 and ProT cover everything from your standard plain white cladding panels. 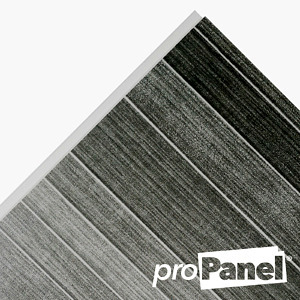 The Pro5 range of cladding is 5mm thickness panels and the Pro8 is the more rigid, stronger 8mm thickness panels in the PROPANEL range. If you are looking for something a bit more they have you regular sparkle effects in the Pro5 and Pro8. 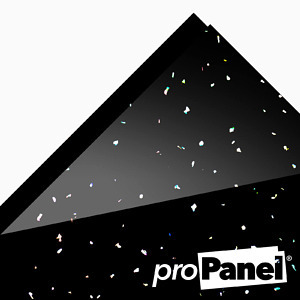 These are great quality patterns compared to many other sparkle panels on the market and have also introduced a new cutting edge style of gemstone panels to the sparkle ranges. 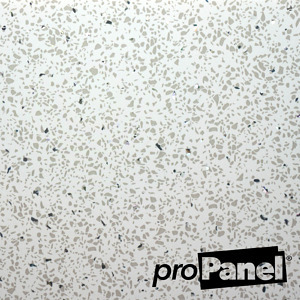 One of the most popular premium panels in their range are the ProT tile effects. 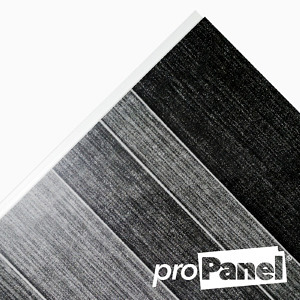 These tile effect panels have grout line grooves cut into the PVC panel face. You would not know they are not tiles until you get close up.